Calgary Rants: Wildrose Party Campaign Tour Bus Tire Failure! 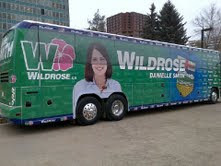 Wildrose Party Campaign Tour Bus Tire Failure! Sometimes a picture really is worth a thousand words! I was shocked this morning when I saw the picture of the Wildrose Party campaign bus making its way around Twitter. At first, I figured that this had to be some kind of "frat boy" photoshop joke, but I guess not. While I think its kind of silly to make light of the picture, you cannot help but laugh at the judgement of this picture placement. I truly believe that the Wildrose Party is so disciplined that to think this is some sort of "error" would be naive. I don't think that it is out of the question to consider that this placement was intentional or that once the mistake was realized, they decided to run with it anyways, due to the shock value! I would expect that something as important as your campaign bus branding would have to be vetted by some of the senior leaders in the party. You really cant buy this type of media chatter. Especially with an election call expected within the week. I'd love to hear some of the captions that people would apply to this picture! Wildrose - ripe for tje plucking! I think I'd rather talk about no Dr. intimidation probe and an NDP style budget.....but if the PC Party supporters would prefer to focus on this....by all means. Check out this one Shane.